Hello, yesterday I bought and downloaded Object Desktop. 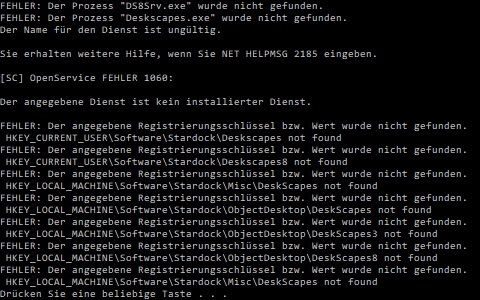 When I try to install DeskScapes from Object Desktop Manager I get the error code 129. I tried downloading and installing DeskScapes without using Object Desktop Manager, which resulted in an error message stating DeskScapes can't be installed because Drive E: does not exist (why would the installation file even be searching for drive E:???). My Notebook runs with Windows 10 Professional, Intel(R) i7 4500U, 8GB RAM, Intel HD Graphics 4400. Is there a chance I can install DeskScapes? Reboot and report back if that worked for you. thank you for answering. I tried the second option you mentioned already 2 days ago when I wasn't able to install DeskScapes from Object Desktop Manager. I did the purge, which resulted in "not found" error messages. I guess the reason is that DeskScapes can't be installed. I add a screenshot, which maybe helps. Is there a proof DeskScapes runs with Win10 PRO? before installing and see if that helps. Also is your subscription to Object Desktop current doesn't need to be renewed ? I always shut down my virus program before installing any kind of program and yes, my subscription is up to date - I bought Object Desktop just 2 days ago.